The image of riding across a beach atop a horse is a common romantic depiction, but it’s also one that is totally possible to achieve. Whether you’re looking for a company that offers beach-based horse riding, or you’re thinking about giving it a try with your own horse, the golden beaches of Florida are the perfect place to make that iconic image of a beach ride astride a horse come true. There are many companies offering horseback riding in the Sunshine State, and many offer beach rides as well. However, riding horses on the beach is more complicated than simply leading your horse to the sand. 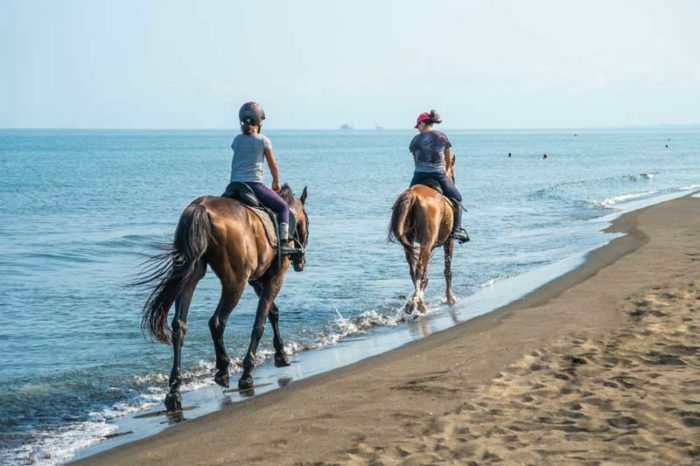 Monika Bruehsel, with CPonies, maintains that while beach rides are not all that different from trail rides, the “biggest difference in care is making sure that the horse, tack, and equipment is hosed off each day,” she shares. Otherwise, the salt water would corrode most metals and build up on the horses’ coats. Other differences include the use of some special equipment, according to Bruehsel. “We ride in biothane bridles and synthetic abetta saddles with stainless parts. We also use breast collars to insure the tack does not slide back,” she explains. The horses are also attended to concerning food and water and the length of time they work, which is always a concern in Florida’s heat. “We provide plenty of water while at the beach, and they get grain and hay both before the beach and after,” Brueshel shares. Brueshel shared that beach riding and salt water are good for the horses too. Many of the horses—which are Gypsy Drum horses, a strong working class of horse that is “an important member of the Queen of England’s Band of the Life Guards”—come with poor health and skin or hoof conditions, and the beach riding actually creates improvements. “Water therapy for horse is the same as in people. The benefits and results are amazing,” Brueshel explains. “The water is low-impact exercise, so it is great to help recover from injury or joint issues etc. I have had horses come to me lame and with beach time make full recoveries. The salt water dries out feet, which here in Florida is needed,” she adds. For those wanting to ride their own horses at the beach, Dr. Katie Hennessy, a veterinarian and the owner of Polk Equine in Frostproof, has her own advice.